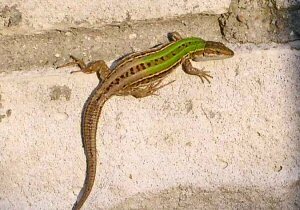 In build this species is very similar to the Wall Lizard but generally (and certainly in the case of those which were most commonly imported into the UK) very distinctly marked and coloured. They grow somewhat larger than the Wall Lizard and can exceed the length of a large Sand Lizard. They are not, however, as bulky as these animals. The two sub-species most commonly kept in the UK (P.s.sicula and P.s campestris) tend to have a dark vertebral strip which is particularly pronounced in the anterior of the body against a leaf green background. The flanks are usually marbled with black against a white or green background and there is frequently (almost invariably) a prominent blue centred occellation behind the front shoulder. As their name suggests, their favoured habitat is walls, or similar naturally occurring rock formations where they take advantage of nooks and crannies in the wall or rock to conceal themselves. They do, however, tend to use densely vegetated areas rather more than Wall Lizards. They are rather shy and extremely fast moving lizards. One of the first "exotic" species I ever kept I have always found them reasonably easy to keep and great fun - despite their tendencies towards open warfare on each other and almost anything else! This species can be kept in an indoor vivarium although it is unlikely to realise anything like its full life span. In addition, being extremely agile, lively and often highly strung they need a disproportionately large vivarium. Last, but not least, males in particular are extremely aggressively territorial as are some females. This even shows in their relationship with other species, even those considerably larger than them. Quite simply you should not expect these animals to share a vivarium with any others. Consequently, an absolute minimum of a 1 metre by 0.5 metre vivarium would be required for a single pair. It should be noted that they can even be aggressive towards substantially larger lizard species. The name "Wall lizard" is well descriptive of their habitat. Accordingly the terrarium benefits from rocks or similar heaped to provide basking and hiding areas. But, you must ensure that the rocks are well fixed and cannot move thereby crushing the lizards. They are fairly tolerant in respect of soil types and sand, grit, gravel or one of the available artificial compounds are all suitable. In fact, the conventional semi-desert setup suits them down to the ground. A water bowl and a light spray in the morning are necessary to take care of their moisture requirements. UV lighting and a substantial temperature gradient are essential to their well-being. The ambient temperature during the summer should be around 25-30ºC during daytime in the summer with a basking hotspot of around 40ºC. At night the temperature should drop to around 15ºC. During the winter, the overall temperature should be held between 5 and 10º. Should the temperature grow warmer than this, since they typically brumate rather than hibernate they will become active but can happily be cooled down again until Spring. To see these animals at their best an outdoor vivarium is far better. A small garden frame will again support a pair and numbers can be increased as space permits. 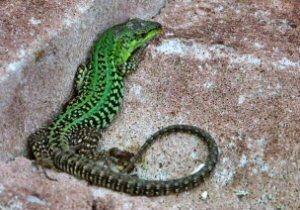 Excellent drainage is essential as they do not happily tolerate excess humidity although they do prefer and use more vegetative cover than Podarcis muralis. Just as with indoor vivaria, they will do best if provided with a rock pile, or even a wall in which they can hide and on which they bask. They can and will live happily in the South of the UK in such an enclosure for many years. Further north or in particularly cold or wet areas are they likely to need additional shelter such as might be provided by keeping them in a greenhouse. Mating starts during the Spring and is typical of lacertids (see our Breeding pages). After a period of 4-6 weeks the female will be extremely fat although individual egg bulges are seldom visible. She will usually dig one or two test burrows in a warm spot before choosing where to lay the eggs but these animals cannot be relied upon to do this or to use available sand. Eggs may be laid in sand, under, rocks or even under vegetation and can often be very difficult to find. 2 to 6 eggs are laid typically and, ideally, these should be found and incubated artificially although unlike most captive species their is a good chance of these incubating naturally if not found.. When the young hatch, they will usually start feeding within 24 hours of birth. Like P. muralis, both first and second clutches, if not found, will generally incubate and hatch out naturally in the south of England. This species will mate and lay repeated clutches throughout much of the Spring and Summer. I have often had 3 clutches a year and on at least one occasion a female has produced 5. It is wise to keep them separated from the adults until they are at least half grown or they will almost certainly be cannibalised. Although growth is extremely rapid it may not be possible to put them back with the adults unless the vivarium is substantial due to the animal's aggressive nature. These are primarily insectivorous lizards and should be fed a suitable range of insects. When fully grown they can handle any of the small invertebrates listed in our live foods page. These should be gut loaded and dusted with a suitable multivitamin powder. If you are fortunate enough to have them breed then at this stage they require extremely small insects - "micro" crickets are good as are buffalo worms or other similar sized prey. Gut-loading and vitamin dusting are essential. This is now a "European Protected Species". In essence this means that any wild caught ones are probably illegal. There may be an exception in terms of the ones found in the UK as they are not native but this is not currently clear under the UK legislation implementing Annex IV of the Habitats Directive. A few enthusiasts do keep and breed this species and it is probably only through them that you could obtain animals. Once again, ensure you obtain some form of Certificate of Origin confirming that these are captive bred animals.